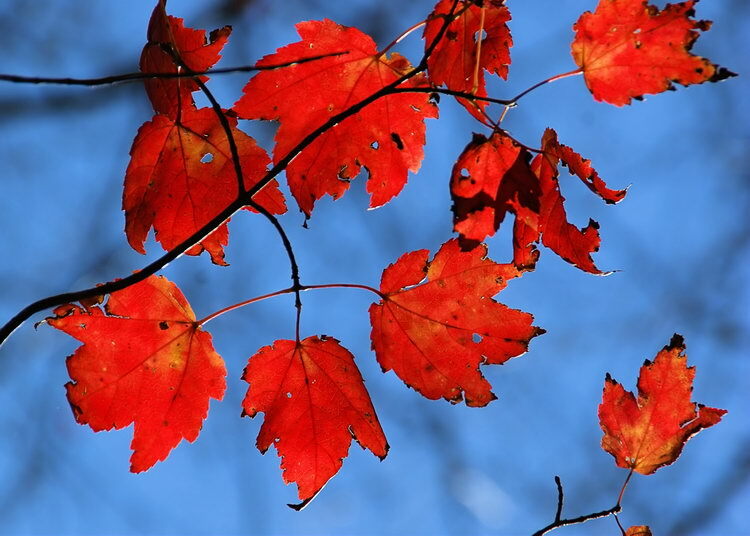 Here are some Red Maple leaves that I saw while strolling through David Weld Sanctuary recently. There’s some controversy over these leaves. I should start by explaining that I really don’t know Jack about any kinds of foliage, be it trees, bushes, or flowers. On those occasions when identify a flower or any other plant-type thingy, its only because I’ve managed to use a field guide correctly, which is very rare, or, more likely, one of my (much) more knowledgeable friends has made the identification for me. Incidentally, this is how I became involved with the Four Harbors Audubon Society. I’m kinda lousy with bird identifications as well, so I would send my pics to them for help and now I’m their photographer. It’s friends like these that allow me to appear intelligent and informed in my posts. Trust me, this is no easy trick so I need to reach out to a lot of people. It’s too big a job for any one person. So, back to the story at hand. I sent this pic out to a few of the folks that I thought could help me out with this pic. I got two replies to my query. Elaine, from the Four Harbors Audubon Society was the first to get back to me. I had asked Elaine because on one of our recent Audubon walks at Avalon she really impressed me with her knowledge of plants. Red Maple, she wrote me. She’s got one in her yard, the “prettiest tree in all the woods in the fall”. I looked up Red Maple in a couple of my guides and, yeah, Elaine was right. Then my buddy John emailed me. John is my usual go-to guy for trees. He was sure that these leaves were Black Maple. He even looked them up in his Grimm’s Illustrated Book of Trees. I did the same with my own Grimm’s. John pointed out that the leaves were much more like Black Maple rather than Red. (Grimm’s uses all line drawing but the drawings are very good. It’s not a lesser guide by any means.) I could see that John had a point. Looking at the Grimm’s drawings, you could see that the leaves were shaped more like Black than Red. The Red leaves seem to be much more serrated than the Black’s. While Grimm’s mentions the beautiful red fall colors of the Red Maple, it makes no mention of the autumn colors of the Black Maple. Then it was back to the books for me. My Peterson’s Trees and Shrubs mentions that Black Maples prefer mature upland woodlands and that Red Maples prefer wet woods. Grimm’s even mentions that another name for the Red Maple is Swamp Maple. I remember the general area where I took the shot, and while the ground is dry at that spot, there is swampy land less than a hundred feet away. Then I looked at my National Audubon Society Field Guide to Trees, which, by the way, is a very nice little field guide. The Audubon guide says that the Black Maple has leaves that turn yellow in autumn.